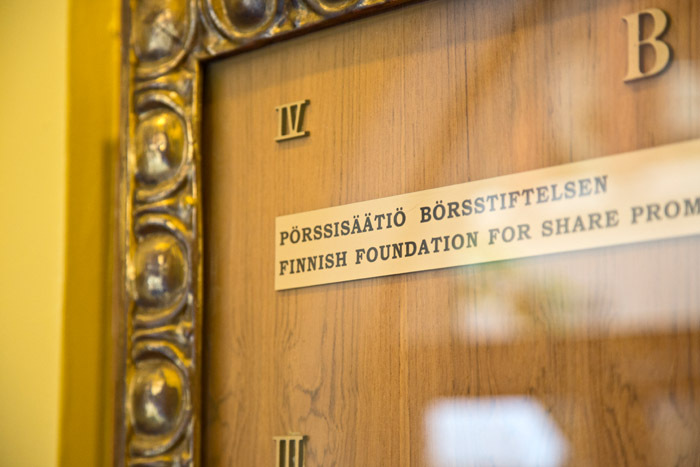 The Finnish Foundation for Share Promotion is a neutral foundation that finances its operations with the rental income of the Stock Exchange Building Oy. Founded in 1985, its goal is to promote securities investment and the securities market, as defined in its rules (in Finnish). Sari Lounasmeri is the President and CEO of the Foundation. The Foundation has a board of directors. The goal of the Finnish Foundation for Share Promotion is to make it possible for companies to acquire risk capital in reliable, supervised and effective markets that have ideal prerequisites for trading as well as versatile and interesting investment objects. The Foundation is working to improve the quality of information available to investors. It also strives to keep the conditions of taxation and legislation reasonable for investors. The Finnish Foundation for Share Promotion raises awareness on the securities market through its publications, research, training and events relating to the securities market. The Foundation publishes guides aimed at the general public, which discuss the basic concepts of investment, various types of securities and taxation of investments. It also produces materials for teachers at different school levels. The Foundation organises Investment Evenings for private investors during spring and autumn. We also organise training sessions and publish materials for professionals in the securities market, the media and listed companies. The Finnish Foundation for Share Promotion allocates grants annually. The grants are usually given for post-graduate research and studies relating to the stock market. Here you can find details of all contacts in the Finnish Foundation for Share Promotion. You can find our logos and press photos here. You can find rules of The Finnish Foundation for Share Promotion here.